Hitch Failures | Nashville Truck Accident Lawyers The Law Offices of John Day, P.C. A towing- related accident can be caused by a hitch failure. Every trailer is attached, or hitched, to its towing vehicle. This attachment may be by hitch, coupling, chain, ball hitch, pintle hook, or some other mechanism. For some trailers, the type of hitch and back-up connection used is regulated by state law. No matter what type of hitch is used, though, a failure or malfunction can have catastrophic results. One of the most common reasons for hitch failure is improper assembly. Often, people with little experience are assembling and connecting hitches, thereby putting other drivers at serious risk. When a hitch is not properly assembled and installed, a trailer is far more likely to become detached from its towing vehicle. 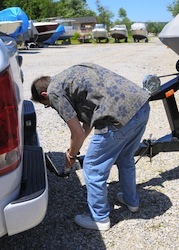 Other common causes of hitch failure include the wrong hitch being used (often due to the inexperience of the person installing the hitch as explained above); the hitch being worn out and not replaced; or the hitch not being designed to carry the amount of weight on the trailer. If you believe your accident may have been caused by hitch failure, call us anytime at 615-742-4880 or toll-free at 866.812.8787 or contact us online for a no-cost, no-obligation consultation. We will review your case and let you know if we can help. Our award-winning lawyers handle all accident cases on a contingency basis so we only get paid if we recover money for you.